As a trusted Microsoft Gold Partner for 15 years, Tallan has been at the forefront of educating clients and the marketplace at large about the benefits of SQL Server, helping them understand and evaluate how new features and benefits can work for their business needs. 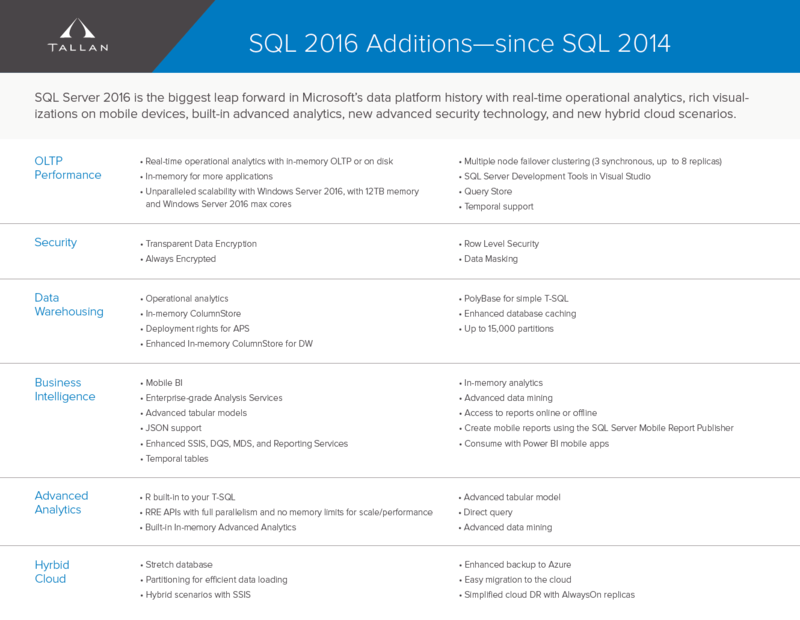 That is why we are so excited to join Microsoft in introducing SQL Server 2016. Enjoy faster queries with memory-optimized tables that now support even faster online transaction processing (OLTP) workloads. Analytics workloads are 100x faster than previous versions with updateable, clustered columnstore indexes. Enhancements to tabular models provide greater flexibility for the design of models, and an array of new tools helps you develop solutions more quickly and easily. Use SQL Server R Services to build secure, advanced-analytics solutions, explore data and build predictive models by using R functions in-database. Then deploy these models for production use in applications and reporting tools. Enhanced peace of mind with 3 new security features – Always Encrypted, Row-Level Security, and Dynamic Data Masking – each providing a different level of data protection. Your business users now have secure access to reports on the web, in Microsoft Power BI apps, or on a Microsoft SharePoint site. This rich set of tools enables developers to extend and customize their reporting solution using a familiar development environment. Query distributed data sets using Transact-SQL statements to query Hadoop, or SQL Azure blog storage. Write adhoc queries to join relational data from SQL Server with semi-structured data and leverage SQL Server’s on the fly column store indexing to optimize your queries against semi-structured data. This is a great solution for organizations as they grow and spread data across many distributed locations. Save historical execution plans and query statistics in order to track over time. This feature provides greater visibility than previously available features that only allowed you to see active execution plans using dynamic management views. Exploring an upgrade? Learn more about the features and benefits available for SQL Server 2016 at various licensing levels and choose which works best for your business needs. Currently using SQL Server 2008 R2, 2012, or 2014? Discover all the new features added since you last upgraded. 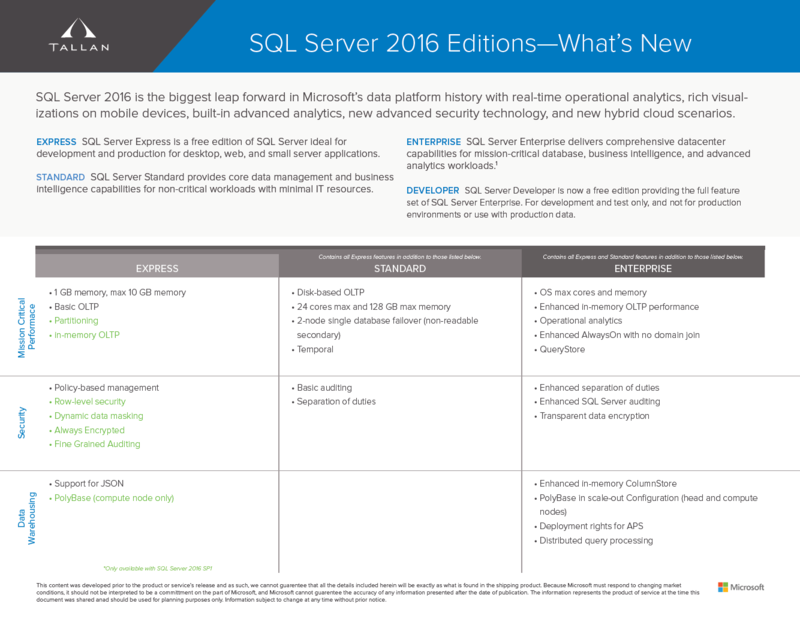 SQL Server 2016 is the biggest leap forward in Microsoft’s data platform history. and how it can benefit your business? Download the Resource Pack now!